Qing Dynasty style wedding dress. Traditional Han clothing comprises all traditional clothing classifications of the Han Chinese with a recorded history of more than three millennia until the end of the Ming Dynasty. Depending on one's status in society, each social class had a different sense of fashion in ancient China. Most Chinese men wore Chinese black cotton shoes, but wealthy higher class people would wear tough black leather shoes for formal occasions. Very rich and wealthy men would wear very bright, beautiful silk shoes sometimes having leather on the inside. Women would wear silk shoes, with certain wealthy women practicing bound feet wearing coated Lotus shoes as a status symbol until in the early 20th century. Men's shoes were usually less elaborate than women's. Chinese civil or military officials used a variety of codes to show their rank and position. The most recognized is the Mandarin square or rank badge. Another way to show social standing and civil rank was the use of colorful hat knobs fixed on the top of their hats. The specific hat knob on one's hat determined one's rank,as there were twelve types of hat knobs representing the nine distinctive ranks of the civil or military position. 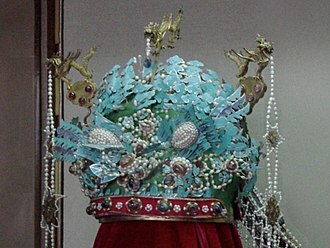 Variations existed for Ming Dynasty official head wear. In the Qing Dynasty different patterns of robes represented different ranks. called Shoe of Queen Marysieńka in the District Museum in Tarnów is an example of late 17th-century Qing Dynasty shoemaking. The damask and satin body was mounted on cardboard sole. The rise of the Manchu Qing Dynasty in many ways represented a new clothing styles were required to be worn by all noblemen and officials. Eventually, this style became widespread among the commoners. 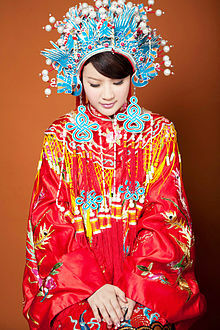 A new style of dress, called tangzhuang, included the changshan worn by men and the qipao worn by women. Manchu official headwear differed from the Ming version, but the Qing continued to use the Mandarin square. It was around this time that foot binding became more popular. 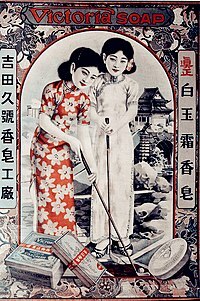 Two women wearing cheongsams (qipao) in a 1930s Shanghai advertisement for "Victoria Soap". The abolition of imperial China in 1912 had an immediate effect on dress and customs. The largely Han Chinese population immediately cut off their queues they had been forced to grow in submission to the overthrown Qing Dynasty. Sun Yat-sen popularised a new style of men's wear, featuring jacket and trousers instead of the robes worn previously. Adapted from Japanese student wear, this style of dress became known as the Zhongshan suit (Zhongshan being one of Sun Yat-sen's given names in Chinese). For women, a transformation of the traditional qipao resulted in a slender form-fitting dress with a high cut. This new "cheongsam" contrasted sharply with the traditional qipao but has largely replaced it in modern fashion. In the early republican period, the traditional dudou underbodice was largely abandoned in favor of western-style corsets and bras. Early in the People's Republic, Mao Zedong would inspire Chinese fashion with his own variant of the Zhongshan suit, which would be known to the west as Mao suit. Meanwhile, Sun Yat-sen's widow, Soong Ching-ling, popularized the cheongsam as the standard female dress. At the same time, old practices such as footbinding, which had been viewed as backwards and unmodern by both the Chinese as well as Westerners, were forbidden. Around the Destruction of the "Four Olds" period in 1964, almost anything seen as part of Traditional Chinese culture would lead to problems with the Communist Red Guards. Items that attracted dangerous attention if caught in the public included jeans, high heels, Western-style coats, ties, jewelry, cheongsams, and long hair. These items were regarded as symbols of bourgeois lifestyle, which represented wealth. Citizens had to avoid them or suffer serious consequences such as torture or beatings by the guards. A number of these items were thrown into the streets to embarrass the citizens. Hong Kong clothing brand Shanghai Tang's design concept is inspired by historical Chinese clothing. It set out to rejuvenate Chinese fashion of the 1920s and 30s, in bright colors and with a modern twist. Other Chinese luxury brands include NE Tiger, Guo Pei, and Laurence Xu. In the year 2000, dudou-inspired blouses appeared in the summer collections of Versace and Miu Miu, leading to its adoption within China as a revealing form of outerwear. For the 2012 Hong Kong Sevens tournament, sportswear brand Kukri Sports teamed up with Hong Kong lifestyle retail store G.O.D. to produce merchandising, which included traditional Chinese jackets and Cheongsam-inspired ladies polo shirts. In recent years, renewed interest in traditional Chinese culture has led to a movement in China advocating for the revival of ancient Han Chinese clothing. However, some scholars' research mention that the modern definition of "Hanfu", which was in fact originally published on the Baidu Baike website and other websites in china, was an empty concept created by internet user. With many of these clothing changes red was a popular colour found on garments because of its beliefs that it brings good luck. Therefore, people would have a lot of red on their clothes. 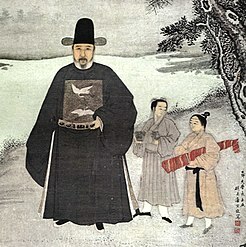 A 15th-century portrait of the Ming official Jiang Shunfu. The decoration of two cranes on his chest are a Mandarin square "rank badge" that indicate he was a civil official of the first rank. Officers of the Chinese Consolidated Benevolent Association in the United States in tangzhuang dress, with riding jackets (馬褂) over changshan. ^ Yang, Shaorong (2004). Chinese Clothing: Costumes, Adornments and Culture (Arts of China). Long River Press (published April 1, 2004). p. 3. ISBN 978-1592650194. ^ Brown,, John (2006). China, Japan, Korea: Culture and Customs. Createspace Independent Publishing (published September 7, 2006). p. 79. ISBN 978-1419648939. ^ a b Łukasz Sęk. "Chiński bucik królowej Marysieńki Sobieskiej" (in Polish). www.it.tarnow.pl. Retrieved 7 July 2014. ^ Broun, Samantha (6 April 2006). "Designing a global brand". CNN World. Retrieved 2 June 2012. ^ 1 Archived 2014-01-10 at the Wayback Machine. ^ "China's Hainan Airlines: Coolest cabin crew uniforms ever?". CNN World. 14 July 2017. Retrieved 14 July 2017. ^ "G.O.D. and Kukri Design Collaborate for the Rugby Sevens". Hong Kong Tatler. 16 March 2012. Retrieved 19 November 2012. ^ "G.O.D. x Kukri". G.O.D. official website. Archived from the original on 15 May 2012. Retrieved 19 November 2012. ^ "Kukri and G.O.D. collaborate on HK7s Range!". Kukri Sports. Archived from the original on 2 February 2014. Retrieved 19 November 2012. ^ Bullock, Olivia (November 13, 2014). "Hanfu Movement Brings Back Traditional Fashion". The World of Chinese. Retrieved July 30, 2016. ^ Wee, Teo Cheng (November 20, 2015). "Stepping back in time at China's schools for traditional culture and Confucianism". Retrieved July 30, 2016 – via The Straits Times. ^ Zhou, Dongxu (June 18, 2015). "China Prepares 'Traditional Culture' Textbooks for Its Officials". Retrieved July 30, 2016 – via Caixin. ^ 羅, 雪揮 (2005-09-05). "《「漢服」先鋒》". 《中國新聞周刊》. ^ ""汉服运动":互联网时代的种族性民族主义--《中国青年政治学院学报》2009年04期". 2016-08-04. Retrieved 2005-09-01. Wikimedia Commons has media related to Clothing of China.